10 years ago, retailers sold just 15-20% of their inventory at some kind of promo price – today, that number is 40-45%. Put simply, sales of sales have more than doubled in a decade. America has transformed into a country where everyone has caught bargain fever. Discounts happen more frequently and with deeper price slashing than even a decade ago: where once sales were used to juice traffic on certain days, Groupon and its ilk have made sales a daily concept. Discounts are no longer the exception, they're the norm. Indeed, as those discounts accelerate, full price has become a quaint, retro notion that's rapidly losing any meaning. Everyone wants a deal, a steal, a hook‐up to a discount or a way to cut costs. People don’t only want a deep discount, they expect it, and won’t settle for anything less. Are you one of the 25% of Americans who are genetically programmed to be bargain addicts, unable to resist the pull of a hormone nicknamed buyagra? What are the four magic words that will wrangle a discount out of virtually any sales assistant? Why isn’t it ever worth shopping the SALE rack at a department store? Are you carrying a superfake designer handbag without even knowing it? How does one woman earn a million dollars every year – simply by reselling coupons? Who runs America’s best sample sales – and why are some of them top secret? Why is much of the merchandise at any outlet mall not even worth browsing? And the most important question of all: why are we always chasing a deal today, and what does it mean for the future? 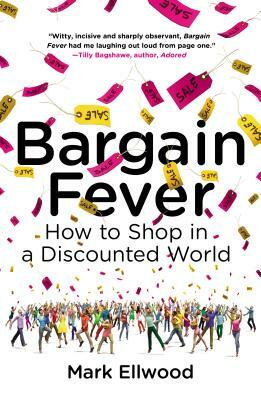 A book after my own heart, Bargain Fever lifts the veils off the sales, ensuring even more that you'll never pay retail again. - Carmen Wong Ulrich, financial contributor, CBS This Morning & author "Generation Debt"
You can pick up a copy of Mark’s latest book via Amazon, iTunes or from a local bookstore.